I have now received 2 of Rex Rossano Perez' wonderful puzzles as gifts now. I wrote about the first one which was given to me by my friend Ali and Rex himself here in September last year and then another 2 of them which I bought from Rex here. 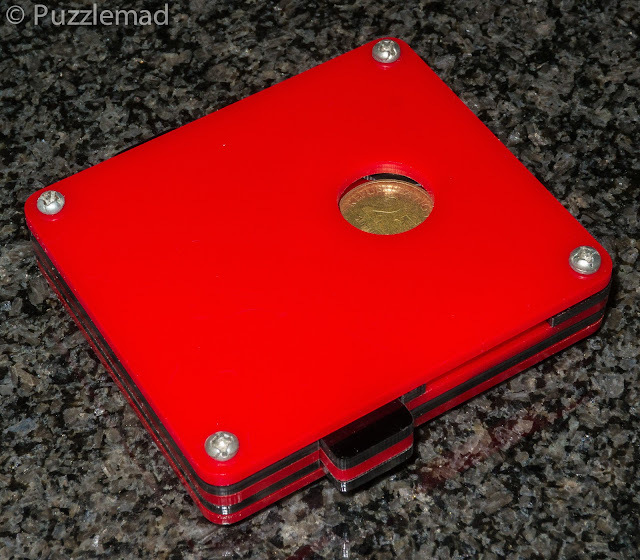 They are beautifully made puzzles cut from Acrylic and the common feature is that there is always a Filipino coin inside needing to be released by some mechanism or other - it may be a maze, a sequential discovery puzzle using tools provided or a sequential movement/sliding piece puzzle. I successfully solved the first 3 and was terribly chuffed because the internal mechanism of these is pretty complex. On Facebook Rex has designed and produced (in limited numbers another bunch all with a similar theme and I am quite keen to try out some more. The Kusing 25 was another gift from Rex and after a very long trip around the world, it arrived in early March. After the obligatory photos I set to playing with it and within a few moments dropped a tiny piece/tool out onto the cats head and lost it down the side of my chair cushion. After a fair bit of cursing, a scratch from the unimpressed cat, I retrieved it and had a look to see where it came from and what I had done to get it to come out of the tiny hole. 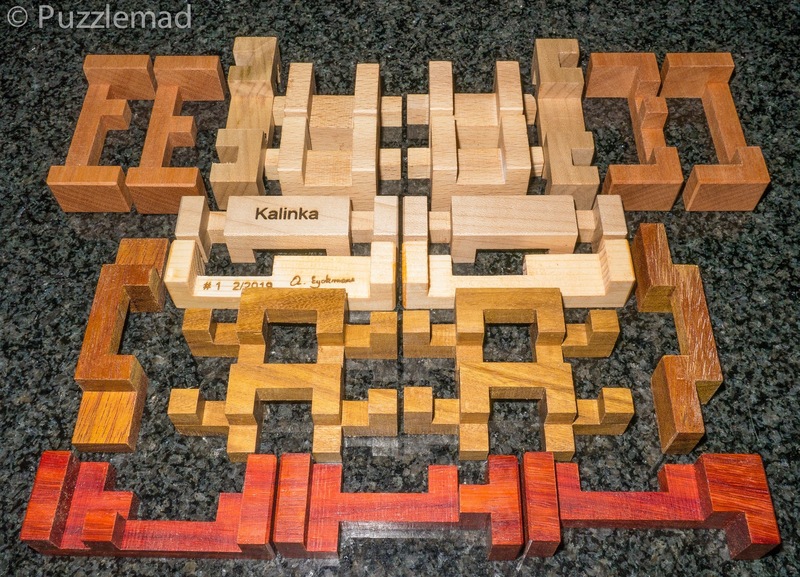 Much to my chagrin, I was completely unable to put the piece back into the puzzle! The hole from which it had dropped had closed over and nothing I did would allow it to be reinserted! You can see where this tale of woe is going, can't you? Having failed to backtrack, I decided to continue puzzling and see what could be achieved by using that tool in the two suspicious looking holes in the bottom of the puzzle. As if invited by the designer, I inserted the tool into one of the hoes and twisted randomly...nope no change in the puzzle. On to the second hole and suddenly the slider was able to move back and forth. Twisting around I could stop and start the slider moving and at times was unable to twist the tool anymore. I played with this for a whole evening and nothing seemed to be happening! On evening 2 I persisted in my random fiddlings and noticed that despite keeping the tool rotated in one place the slider seemed to sometimes move and sometimes not move. At some point during this, the coin was suddenly able to move inside the puzzle - I had absolutely no idea why! Manfully, I persisted in further random movements for several days and, all of a sudden, the coin dropped onto the cat! YAY! I think! It was solved! Except it really wasn't. A puzzle is NOT solved until it has been done, undone and done again. The important thing is to understand how it works - I wrote about this here and here. It was time to try and reset it back to the beginning and try again - GULP! Solved it! Except I hadn't really! No idea how I got this far. 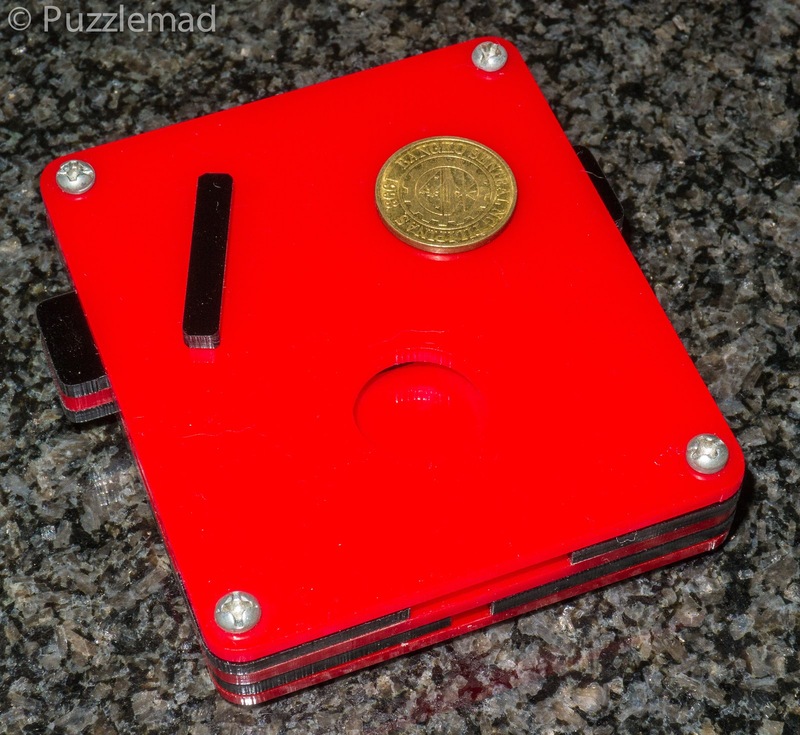 I have spent the last 3 weeks trying to reset this blasted puzzle and somehow managed to lock the coin back inside without understanding how but could not get the coin locked under the window and certainly not get the tool to stay in its small receptacle. To my eternal shame, I ended up undoing the nuts on the puzzle and gingerly pulling apart the layers! OMG! That is an incredibly complex and clever mechanism! I am absolutely amazed that I managed to remove the coin by accident. It took me about a ½ hour to understand all the steps and then another hour to get the pieces all back into position! Damn! That takes some dexterity! 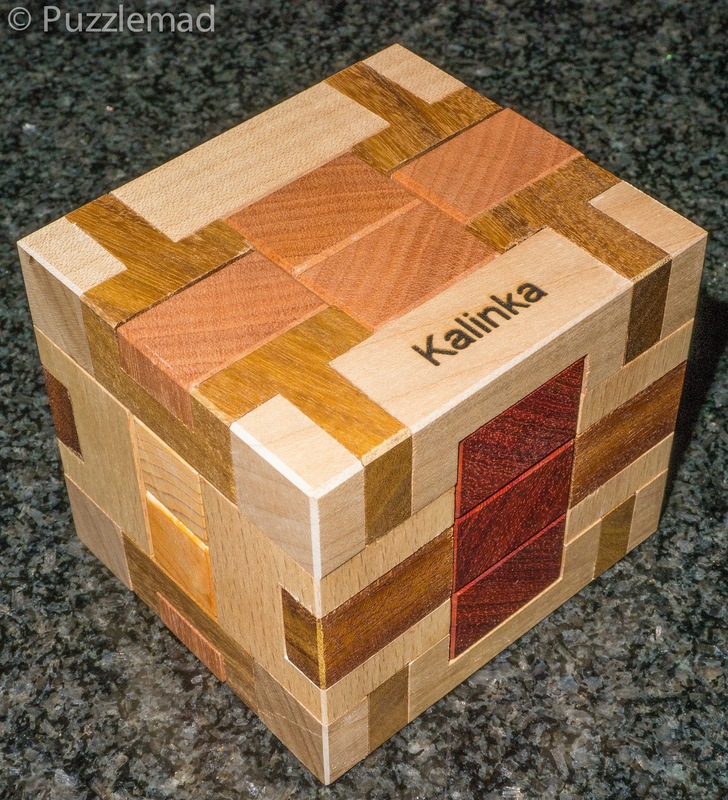 Starting with a fully reset puzzle, I went through what I thought was the correct set of moves and it seemed to be working when suddenly a new piece fell out! That wasn't supposed to happen! Back to pieces it went and I saw my silly mistake and this time it was a functioning puzzle. With the benefit of hindsight/maliciously dismantling the bloody thing, I am now able to retrieve the coin almost at will and then put it back. The toughest part of it is the reset - getting the tool back into its little hole. This is an amazing and complex sequential discovery/sequential movement puzzle which really beat me and is well worth obtaining if you can. Don't expect to beat it quickly or easily! I am completely addicted to interlocking cube puzzles and I could not resist buying another 5 of them from Alfons Eyckmans. Apart from having very little time to play, I have worked on several of them and not gotten very far. Yesterday I had an hour to spare and Mrs S allowed me to play with one in peace. Eventually, I produced my lovely pile of pieces and created a Burrtools file! Unfortunately, I cannot put it back together unaided! My computer has been trying to find the solution and after working for 16 hours so far is nowhere near a solution. 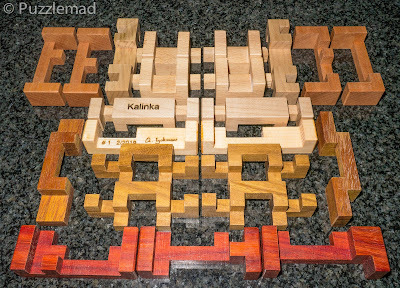 It just recently announced that it might take another 1.2 years which is probably more time than Mrs S will allow me to have a pile of pieces lying around! My iMac is 12 years old and kinda struggles with complex tasks! You can help BurrTools and that would probably reduce the solving time to something very manageable. Just use the color constraints on the pieces and the end result cube. Instead of the target just being the shape of the cube (outer voxels set) and internal left for maybe (voxels are with a 'dot' to mark possibly set or not set). You should actually look at the photo you provided of the initial cube and set color constraints on many of the external voxels, setting these colors on the different pieces. The result would be way fewer assemblies to consider and very likely that it won't take long to find a solution. In fact, without the color constraints, not only will it take much longer, but it's also possible (since I don't know the design) that there will be many solutions but not necessarily with this level or resulting in the exact color pattern you started with. I tried to make the colouring work but for some reason it failed to find any assemblies at all. It’s quite a tough one to get coloured as there are so many colours in it. Maybe if I had more time then I would have had more success. I have the BT files now and have seen how he did it. I'm not sure why my file wouldn't work but at least I have a resembled puzzle now. Are you sure that I've not discovered everything? I have completely dismantled it and put it back together. I can solve it every time now and can't think what I've missed!